Why Select the NOAA Top Tens? NOAA Fisheries surveys commercial catches like this one every year for its biostatistical menhaden data set that it uses to assess menhaden stocks and to manage the nation’s second-largest fishery. 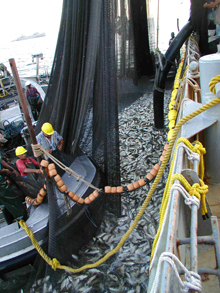 This and two other long-term regional fisheries data sets–the California Cooperative Oceanic Fisheries Investigations and the Northeast Bottom Trawl Surveys–combine to make up one of NOAA’s Top Ten Foundation Data Sets. Very simply, we selected the NOAA Top Tens because we are proud of who we are, what we do, our public service, and our rich, rich history in American science. We wanted to honor, commemorate, and celebrate NOAA’s most notable people and achievements and demonstrate that we greatly respect and are inspired by our past. It is the right time to reflect on the individuals, events, and work that have preceded us, and a way to shed perspective on 200 years of astonishing history. Some have suggested that the NOAA Top Tens are akin to grand bicentennial highlight reports. We chose top tens to instill pride in everyone in the NOAA family and to share our pride with the American public and people around the world. No thoughtful person who explores the span of NOAA science, technology, and stewardship can help but marvel at the breadth of NOAA’s global “beat” of earth, ocean, atmosphere and space and its achievements in these realms. Some will be astounded and awe-struck! We also picked top tens because they are interesting and fun. Top tens are a part of American culture. However, not every nomination can win. Just like selecting the top ten movies or books, differences of opinion undoubtedly will spark debate. Spirited discussions over who makes the final list are part of the fun of top tens no matter the topic, and we welcome them. But we leave it to our descendants at the next anniversary milestone to resolve them. A dome that houses and protects Doppler radar equipment. Doppler radar allowed NOAA’s National Weather Service to measure motion inside storms for the first time beginning in the 1990s. This provided valuable clues to forecasting severe weather and dramatically increased the accuracy and lead time of tornado warnings. 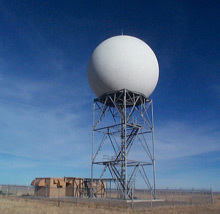 This system of radar for tornado detection and warning, known as NEXRAD, is one of NOAA’s Top Ten Breakthroughs. History Makers. These are the pioneers, the visionaries, the stalwarts, models of commitment and perseverance, and the brilliant minds whose foresight and courage have built and brought respect to NOAA and all its predecessor organizations. For those of us in the NOAA family, these are the giants on whose shoulders we all stand. Historic Events. These are significant moments or long-term episodes within or outside of NOAA, that affected NOAA or its predecessor organizations disproportionately to most others. They may have required extraordinary effort to exercise NOAA’s capabilities or may have paved the way for remarkable advances in scientific understanding, technology, or resource stewardship. Foundation Data Sets or Products. These have been gathered or produced over many years, serve as underpinnings of NOAA science and technology, and demonstrate long-term institutional dedication and perseverance. They are the signature elements in a long, long list of products and services to the nation and the world. They define NOAA. Santa Cruz Island in the Channel Islands National Marine Sanctuary. Establishing our system of national marine sanctuaries was an outgrowth of intense public concern during the late 1960s and early 1970s over the threats to the health of oceans and coastal areas brought on by oil spills, ocean dumping, and large areas of oxygen depletion. Establishing national marine sanctuaries is one of NOAA’s Top Ten Historic Events. During the summer of 2006, a small working group created a three-part process to name the NOAA Top Tens. To the best of anyone's knowledge, this would be the first time NOAA or its predecessor organizations ever attempted to rate and recognize the high points in their histories in this fashion. Following the creative lead of a long-time NOAA colleague who conceived the idea for top tens, the group first established the four top ten categories and set the eligibility and evaluation criteria. Second, it organized a grassroots nomination process to encourage current or retired NOAA employees or current NOAA contractors to suggest candidates. Individuals responded enthusiastically by submitting 135 nominations across all four categories. Third, the working group convened a nine-member selection committee, representing all NOAA line offices, to evaluate nominations, offer additional candidates, consolidate closely related nominations, and select the winners. The selection committee reached agreement by informal consensus on all but one of the candidates selected for top tens. In that lone instance, committee members cast a formal deciding vote. And in a well-considered gesture of sound judgment, our committee declined any attempt to rank the top tens in order of significance; the lists that you will see are in controversy-less alphabetical order. 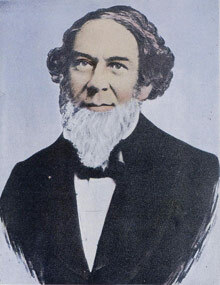 Alexander Dallas Bache, second superintendent of the U.S. Coast Survey. Under Bache, the Coast Survey expanded its geographic realm to include every maritime state and territory. During his tenure, the Coast Survey also enlarged its core missions by studying the Gulf Stream Current, directing tide observers to make meteorological observations, beginning geomagnetic studies, guiding the development of mathematical techniques for adjusting triangulation networks, and computing most probable mathematical values of angles and distances. Bache is one of NOAA’s Top Ten History Makers. Most of you will recognize some very famous names and events among the NOAA Top Tens: Rachel Carson, Hurricane Katrina, the Exxon Valdez Oil Spill, World War II, and the Global Positioning System. A number may be unfamiliar, but some of those hold enormous importance to understanding the well-recognized issue of global climate change. These include the Climate Model, the Mauna Loa Carbon Dioxide Record, and the World Ocean Database. Others hold great significance for human health and public safety like Tornado Detection and Discovering the Cause of the Ozone Hole. Many breakthroughs are “firsts,” and many of the foundation data sets and products define NOAA. In addition to the 40 NOAA Top Tens that we honor and celebrate, 41 equally fascinating honorable mentions attest further to the remarkable work of our organization. We invite you to explore, enjoy, and marvel at some of our greatest people and proudest achievements in this our bicentennial year.